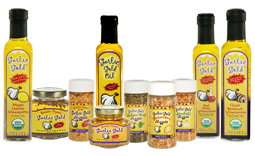 Garlic Gold® Oil and Italian Nuggets are the ultimate time savers for full-flavored, delicious Italian dinners. When you use them in our Italian Wedding Soup, you don’t have to measure out spices or chop garlic, cutting down your prep time in the kitchen. Even better, a pressure cooker reduces your cooking time to just 30 minutes! No need to worry if you don’t have a pressure cooker, though — we’ve included stove-top instructions too. 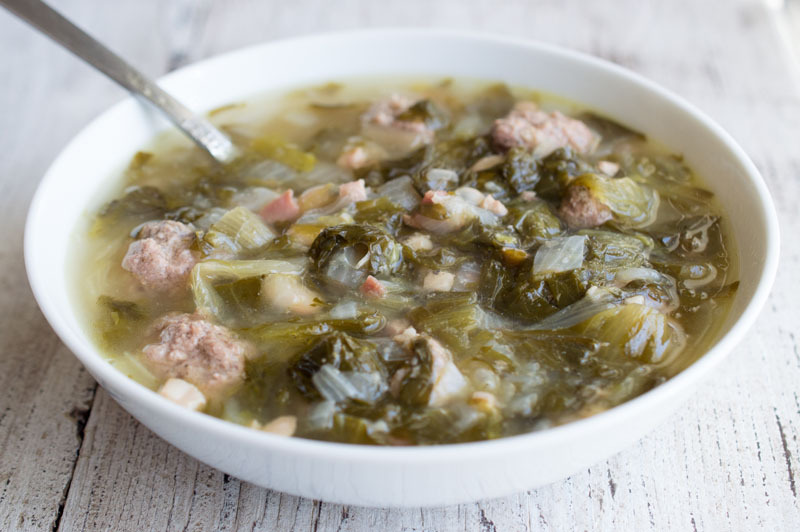 Escarole is a traditional, slightly bitter leafy green for Italian Wedding Soup. Its flavor becomes very mellow when it simmers, so it’s very kid-friendly as greens go! Of course, you can feel free to substitute a bunch of any of your favorite greens — kale, chard, or collards would work well too. Serve this soup for dinner with big hunks of crusty bread alongside. Even better, make some garlic bread with Organic Garlic Gold® Oil and Sea Salt Nuggets. Enjoy! In a medium mixing bowl, use your hands to combine the ground beef, egg, breadcrumbs, Garlic Gold® Italian Nuggets, and salt until evenly mixed. Roll into 1-inch meatballs and set aside. Set an electric pressure cooker to its “Sauté” setting, then add the Garlic Gold® Oil, onion, and pancetta. Stir until the onions are translucent and soft, about 8-10 minutes. Stir the escarole into the pot with the onions and pancetta until wilted down a bit, about 2 minutes. Add the white beans, chicken broth, and meatballs to the pot. Stir gently to evenly mix the meatballs and beans into the broth. Set the pressure cooker to its “High Pressure” setting for 20 minutes. Close the lid, making sure the pressure valve is closed. When the 20 minutes of pressure cooking are up, carefully release the pressure valve. Ladle the soup into bowls and serve hot, with crusty bread alongside. In a large (5 to 6-quart) soup pot or dutch oven, heat the Garlic Gold® Oil over medium heat. Add the onions and pancetta and sauté until the onions are translucent and soft, about 10 minutes. Stir the escarole into the pot with the onions and pancetta until wilted, about 3 minutes. Bring the soup up to a simmer, then turn down to low, cover, and let simmer for 40 minutes. WOW I forgot all about Italian Wedding Soup! Thanks for this time-saving recipe! We just love dinners that cook themselves, don’t you? This baked couscous chicken is the easiest one-dish meal imag… https://t.co/UzxTBKAyHj about 4 minutes ago from Hootsuite Inc.